1. Tell Nautilus to go to the computer. 2. Tell Nautilus to eject the CD-ROM drive. Eject the CD-ROM drive tray. Nautilus cannot mount the volume because the drive is empty; it displays a corresponding message box and does nothing. Thank you for taking the time to report this bug and helping to make Ubuntu better. Unfortunately we can't fix it, because your description didn't include enough information. You may find it helpful to read "How to report bugs effectively" http://www.chiark.greenend.org.uk/~sgtatham/bugs.html. We'd be grateful if you would then provide a more complete description of the problem. 1.1. Tell Nautilus to go to the computer. (Or tell GNOME to browse the computer). The computer contains the CD-ROM drive. 1.2. Tell the CD-ROM drive to eject. To eject the CD-ROM drive tray. Nautilus could not mount the volume because the drive was empty; it displayed a corresponding message box and did nothing. Strange thing is, typing eject from the commandline works without any problem. So it shouldn't be that hard to get nautilus to do the same thing. Still using Nautilus 1:2.24.0-0ubuntu1 on Intrepid beta. Confirmed on Ubuntu 8.10 with updates. This is a particularly problematic problem on CD drives without a manual eject button (e.g. MacBook) after inserting an unreadable CD. Until I discovered this bug report, I did not know how to eject my CD without rebooting. Skipping the check to see if a CD is in the drive first sounds like solving this issue. Can someone apply the backports or upgrade to koala and confirm this? >> Can someone apply the backports or upgrade to koala and confirm this? I have the same problem, but with pressing the physical "eject" button of a DVD drive... (see bug #429290). Can someone on koala and confirm this now? > Can someone on koala and confirm this now? Still present in Karmic. 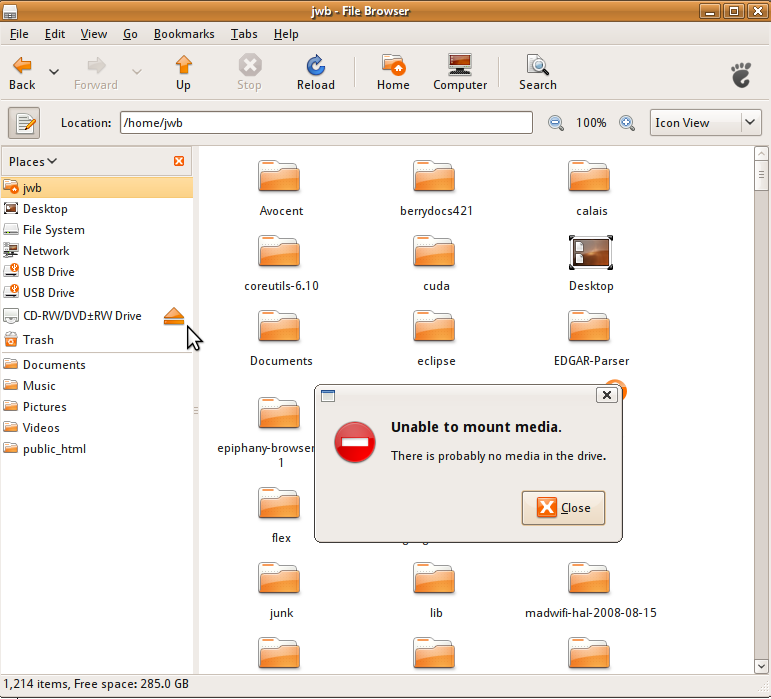 It gives the error "No media in drive"
Yes, happens to me in Karmic. It's sporadic - I think the first eject after a reboot works; but now, nothing works - not the eject button, not nautilus, and not the command eject. Will reboot and try and figure out more. If I start nautilus as root, i.e. $sudo nautilus, then I can press the small "eject" icon next to cdrom0 entry in the sidebar and it works. Previously I thought that it is some privilege problem with gnome-mount. But, what if it is a wrong argument being passed to eject command/call? 1) Nautilus sidebar shows "CD-RW/DVD+RW drive" as user, but a simple "cdrom0" as root. Same problem for me on two recent, fresh installs of Karmic, but here's the twist: This also affects KDE3.5.10 and XFCE 4.6, on two different machines with two completely different DVD devices (and a third that I threw out, thinking it was bad). Could the same piece of software be responsible for this bug occurring on all three desktop environments? This bug was filed over a year and a half ago. Why is it still a problem!? Shortage of developers? Lack of time? If I try to eject from the button on front, it often refuses, because the computer overrides me! If I try to use the command line and it usually works - unless the computer overrides me! If I try to eject using a paperclip in that little hole, it usually works - unless the computer overrides me! I've used Linux for several years now, and I've watched some aspects of it really deteriorate over the last few years. Minor bugs I understand, but this kind of stuff defies the normal behavior of the computer (regardless of OS). Whatever caused this bug should have either been fixed or reverted long ago. If I press the eject button, by $DIETY, that drive had better eject *unconditionally*. I don't care if there's a disc in the drive, I don't care if that disc is mounted or not, and I don't care if some random application throws an error! Eject the flippin' tray! This package has been removed from Ubuntu. Closing all related bugs.